Defining the world one keyword at a time. I've been more cautious about purchasing the books associated with the various Star Trek shows mainly because they tend to play fast and loose with an overall continuity. In distinct contrast the Star Wars books have largely been in a fairly organized larger story that started the Expanded Universe and is now known as the Legends continuity. But yet another Audible member sale came along and I ended up securing a copy of Star Trek: Discovery - After Hours, which is my first venture into written fiction based on the most recent Star Trek show. I wasn't sure what to expect and I didn't even bother to read the synopsis. I just got it since it was on sale. And while it wasn't a bad story on its own, but how it factors into the larger continuity is a little tricky. It's positioned as a prequel but a key aspect of the story may not work well with the coming second season of the show. But who cares, it's just a book, right? 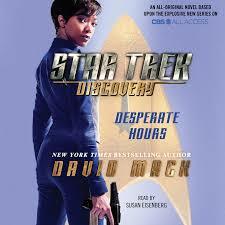 Synopsis: Star Trek: Discovery: Desperate Hours is a Star Trek science fiction novel written by David Mack. It is the first book released for the show and takes place a year before the events of the first season of the show. The Federation colony of Sirsa III finds itself under attack by a deadly probe after a drilling team accidentally hits something unexpected. Given minimal ability to defend itself from the attack, they call for Federation help. The USS Shenzhou under the command of Captain Philippa Georgiou is the closest ship to the colony but the USS Enterprise under Captain Christopher Pike also receives the distress signal. Noting that the Shenzhou is already enroute, they initially do not proceed to the colony. By the time the Shenzhou arrives the Federation team discovers that beyond the probe there is also a massive starship the colonists have come to refer to as the Juggernaut and was the source of the attack drone. In time they are joined by the USS Enterprise with orders to destroy the Juggernaut at all cost - including the lives of the thousands of colonists below. And now Georgiou's hopes for a peaceful resolution to things may rest on the shoulders of her newly appointed first officer Lieutenant Michael Burnham. What I Liked: The book clearly went out of its way to resolve how both the Shenzhou and the Enterprise could exist at the same time given the start differences between the original Star Trek series continuity that looked older and the more recent Star Trek: Discovery series with modern special effects. There were little explanations about why their uniforms were different as tied to their overall status in the fleet and things seemed plausible enough. The story itself was one that followed classic Star Trek ideas with things really boiling down to a series of philosophical debates including whether or not violence was the solution for dealing with the Juggernaut or the eventually discovered crimes of the colonists themselves. This may not seem all that exciting but such moments do truly ring true as Star Trek moments for me and I'm glad that the book returned to this story beat time and time again. What Could Have Been Better: With Captain Pike and the Enterprise playing a role in the second season of Star Trek: Discovery, I'm not sure how this story will interrelate with the coming season, but in these cases the show canon will inevitably trump the book canon. And knowing Star Trek's light touch in terms of managing its expanded universe style fiction, I'm really not confident that this book can be used as any sort of indication of how Pike will interact with the crew on the show. And then the actual challenge that Burnham had to face got a little convoluted over time and wasn't quite as exciting as the story dragged on. It's a small miracle that Georgiou resisted falling Starfleet orders for so long given everything that happened. I'd like to think that her larger track record would be that of a good officer and otherwise she would have made more effort to make her displeasure with those orders know directly with Starfleet command via subspace or something. TL;DR: Star Trek: Discovery - Desperate Hours is an interesting book on its own and can be a lot of fun in this time before the second season of the Netflix show. But once that season comes out, we can only hope things still make sense or at the very least they end up making some references to the story in this book maybe. Thus the audiobook gets a fair 4 attack drones out of a possible 5. The Geeky Guide to Nearly Everything by Rocky Sunico is licensed under a Creative Commons Attribution-NonCommercial-NoDerivs 3.0 Unported License.